What would it be like to eat bland food every day? Besides not being much fun, it could lead to slow starvation due to food fatigue. For those who are ill-prepared for a disaster, that could be their reality, especially if supplies were difficult to procure. 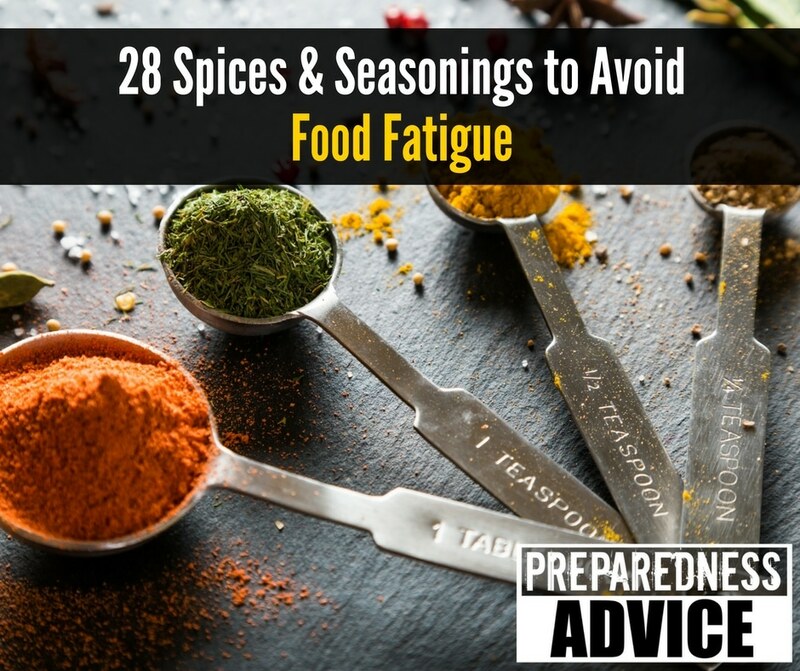 If you think about what kind of spices and oils are important to have on hand for survival cooking, there are a few that would be on my ‘must have’ list. This is a wide variety of seasonings, spices, and herbs that lend themselves to mixing sauces, marinades, rubs, dressings, and so much more. With spices and seasonings, you can mix and match and come up with new flavors again and again. Chili powder on its own might become humdrum, but mixed with cumin, salt, garlic powder, paprika, a little cayenne, and you have an awesome, spicy rub. Experiement with chili powder and come up with something totally different, just by combining different herbs and spices. Picture a plain pot of beans, a meatless meal if there ever was one. Those beans can become a pot of Cuban Beans, Creole Beans, Mexican Beans, West African beans…I could add more to the list, but you get the idea. Mix up the spices and you might barely notice you were eating beans for every meal! Beans are a staple in most preppers food storage, so here are instructions for storing them. Another staple, rice, can be stored in a similar manner and also is extremely versatile. Here’s a recipe for skillet-cooked Mexican rice that can be doctored up with a different combination of spices every time. My wife used to buy envelopes of Schilling and McCormick spice mixes but a few years ago started mixing up her own. I’ve mixed up my own meat rubs, put them in labeled spice jars (we re-use spice jars), and they last for months. When my son needed a gluten-free diet, we got away from all commercial spice mixes, which typically contain gluten, sugar, and too much sodium. Here’s a good article with spice/seasoning mix recipes if you haven’t made your own before. When we first got married, my wife had a herb garden that belonged on the cover of gardening magazines. Basil bushes so huge that we had to prune them back as though they were rose bushes. The cilantro alone could have supplied a chain of Mexican restaurants for 6 months. Growing herbs is simple and dehydrating them is even easier. Right now we have oregano growing in a shady spot in the backyard where nothing else wants to grow. You can dehydrate herbs with a dehydrator like this one (Excalibur is the best brand) or simple by laying the herbs out on a screen and allowing them to dry until crispy. oxygen cause them to deteriorate and lose color and flavor. Remember centuries ago when spices were very, very expensive? So pricey that only royalty and nobles could afford spices? Even salt was dear and hard to get. Yes, spices can get expensive even today, but if you order in bulk and split the spices and shipping cost among spice-ordering friends, your wallet won’t hurt as much. I’ve found that Amazon is a good place to look for spices. I’ve been able to buy my personal favorites in bulk and smaller packages of spices and seasonings I use just on occasion. They also have organic spices and herbs. You hit the nail on the head, 2 weeks of beans and rice with no seasoning could make the best of us depressed. Jalapeno’s always top my list of peppers to liven food up, even a partial supply of your list would be great. This is a good article, good job on it! Also Montreal Chicken Seasoning. It’s terrific. And red pepper flakes! Adobo is another good all around spice from Mexico. I get it and many other inexpensive spices at Save a Lot grocery stores. After learning to cook GF and dairy free I have discovered asian and Indian cuisine. Hungarian and smoked paprika put regular in the back of the cabinet. Try sweet and savory on your meat rather than spicy. Chinese5spice on pork is my favorite now. For 5 or 6 bucks Walmart sells a “Multi Spice shaker” (Coghlans) in their sporting goods section. salt; peprika; curry; cayenne; garlic salt; black pepper. Nice way to keep the spices together. We have that, too. One very handy and versatile product.